COMMUNITY | Where are the Happy Babies? 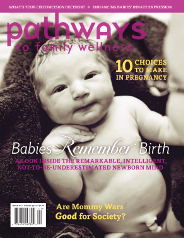 Romm, Aviva, “7 Things To Do Now If You Want To Have A Healthy Baby Someday,” Mind Body Green. Park, Alice, “The Connection Between Dirty Diapers and Childhood Health,” Time. Goer, Henci, The Thinking Woman’s Guide to a Better Birth. August, 1999. Romm, Aviva Jill, The Natural Pregnancy Book: Herbs, Nutrition, and Other Holistic Choices. May 2003. Smith, Linda J., Kroeger, Mary, Impact of Birthing Practices on Breastfeeding. 2010. Ford, Dionna, For My Children: A Mother's Journal of Memories, Wishes and Wisdom. Ford, Dionna, O'Brien, Mandy, Cleaners: Quick and Easy Toxin-Free Recipes. Blow, Charles M., “Failing Forward,” The New York Times, Aug. 2011. Narvaez, Darcia, Neurobiology and the Development of Human Morality: Evolution, Culture and Wisdom. Zaslavsky, Katrina, A Modern Woman’s Guide to a Natural Empowering Birth.